So-called toddler drinks are a growing category of beverages for young ones, but their labels may be misleading customers about their nutrition and health benefits. A study published Monday in the journal Preventive Medicine noted that the drinks -- marketed for children 9 to 36 months who are transitioning from breast or formula feeding to solid foods -- are not recommended by medical experts and provide "no advantage" over whole milk and a nutritionally adequate diet, according to the American Academy of Family Physicians. "Our study builds on previous research demonstrating that manufacturers' marketing practices may undermine the diets of very young children," said the study's lead author Jennifer L. Pomeranz, J.D., MPH, in a press release. Most toddler drinks are typically composed of powdered milk, corn syrup solids or other added caloric sweeteners, and vegetable oil, according to the study, conducted by researchers at the NYU College of Global Public Health and the Rudd Center for Food Policy and Obesity at the University of Connecticut. They contain more sodium and less protein than whole cow's milk. Researchers also said that the drinks' labeling makes them look like infant formulas, which are subject to more oversight by U.S. food label laws and regulations. 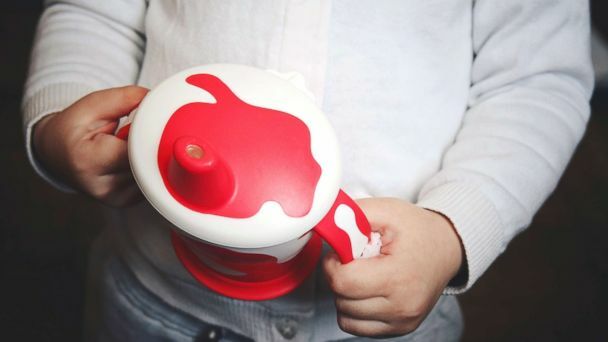 The study recommended the Food and Drug Administration "provide guidance or propose regulations to ensure the appropriate labeling of toddler drinks," according to the press release. Two first-time mothers and three nannies at a Mommy and Me class in Manhattan had never heard of "toddler drinks" when asked by ABC News, but when shown labels of three popular brands of toddler drinks next to the same company's formula, they acknowledged the labels were very similar. However, manufacturers of the toddler drinks maintain the beverages are "safe." "Formula manufacturers take great pride in offering safe, innovative products based on current advancements in the scientific understanding of infant and toddler nutrition," said Mardi Mountford, president of the Infant Nutrition Council of America, an association of manufacturers and marketers of formulated nutrition products. Mountford continued: "Parents and healthcare professionals should have safe, science-supported, and nutritious options to choose from when selecting appropriate foods for their families and patients. Milk-based toddler drinks can contribute significantly to nutritional intake of older infants and young children." What parents feed their infants and toddlers during the transition from exclusive breastfeeding or infant formula to the family diet of solid foods is critical for establishing healthy dietary preferences and preventing obesity in children, according to the study. If parents are turning to toddler drinks because they fear their child isn't getting enough nutrition, the American Academy of Family Physicians recommends that parents concerned about picky eating or missing nutrients use a multivitamin instead of toddler drinks. Jay-Sheree Allen is a family medicine resident physician at the Mayo Clinic in Minnesota and a resident at the ABC News Medical Unit.